← Heath Shaw up to no good… Again! 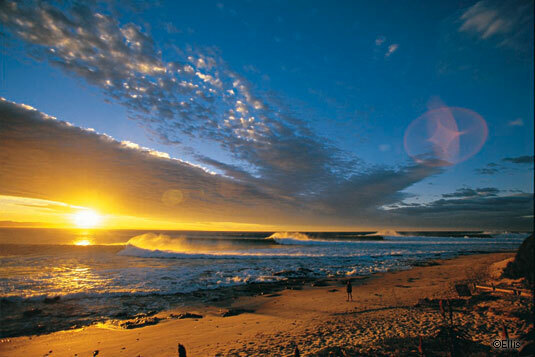 The 2011 Billabong Pro Jefferies Bay is about to get underway in South Africa, with the top 34 male surfers vying off for half a million in coin, and 10,000 ratings points. J-Bay dishes up everything you could have ever wanted in a wave. The perfect point break, also known as Supertubes, is a world class wave that surfers are itching to dig their fins into. The wave starts at the rocky point and travels along the bay, changing from a reef section to a sandbar, and allows surfers to gather copious amounts of speed as they duck into barrels and carve like crazy. J-Bay enables high performance surfing at its best. Last year, local hero Jordy Smith claimed his maiden victory over Australian surfer Adam Melling. The crowd went berserk for his win, and the superstar couldn’t hold back the tears. This year, Melling and Smith will go head to head in round 1 heat 5. Our big boys will also be there; Mick Fanning, Joel Parkinson, Taj Burrow and Kelly Slater. Last year, Parkinson missed J-Bay due to a horrific injury. Fanning will be looking to bolster his points and move up positions on the ratings table. Slater will exhibit his freakish ability and Burrow will be surfing his heart out, aiming to be the 2011 Champion. Dane Reynolds (USA) was set to make a return to competitive surfing, but is a late withdrawal. Reynolds, considered to be one of the most radical surfers, would have added extra excitement to the competition. We’ll just have to wait to the next event to see him in action. The men have just come from a two month break from competitive surfing, making J-Bay the perfect stomping ground to see who’s been training, new maneuvers and to mark territory for the remainder of the year. With the seven and a half hour time difference, you’ll be able to catch all the live action online, without having to stay up till ridiculous hours in the morning.